Yin and yang balance in tai chi means to balance the two opposing forces of the great polarity Yin and Yang within the body. 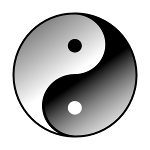 Yin can be described as static and at rest and Yang described as dynamic and active. When these to opposing forces are at balance, then the the tissues, organs, and blood, of the body will be resistant to disease and will be healthy and disease free. The balance also keeps the mind focused in all situations. Not to active and not to un active. This helps keep a cool head in situations that require it and to act in situations where action is required. The way of achieving this balance of the mind requires you to learn to relax the mind and to take charge of mental activities. Calming the mind is necessary to alleviate pressure and stress. This will then help lead to balance of the mind and body. Internal energy Cultivating methods which are learned in tai chi are used to relax the mind and diminish pressure and stress. Here is one of the tai chi movements which help achieve the balance of yin and yang , and is common to all styles of tai chi. It is a balance exercise, reduces stress, and gets the body ready to perform the rest of the tai chi form. The opening form : Stand with your feet shoulder width apart, knees slightly bent, and arms by your sides. Relax the shoulders, round them off. This can be done by inhaling and pulling the shoulders up (stress) and then as you exhale drop the shoulders down with the same timing of your breath which should be a slow exhale (relax). Stand like this inhaling and exhaling in a relaxed manner with deep breaths in and out. Feel that the breath is coming in through the dantian (about three finger down from your belly button) and out through your nose. You should keep doing this until you feel relaxed and stress free. Now left both hands up to about shoulder height in front of the body with the fingers trailing and pointing down, make sure your elbows are bent slightly. breath in during this movement. round off the shoulders and let your arms drop back down, trailing the fingers pointing up to the sky. breath out through this movement. When the hands reach dantian let your fingers face the front, as if you had your hands on a table. Now move your hands back to your sides, and your done. This yin and yang balance exercises will help the body re adjust to a balanced state. It will replenish consumed energy and help to maintain good health. It is also a good tai chi exercise to relieve built up stress.